Keep science lab classrooms organized with our science storage cabinets that are specifically designed for science equipment and supplies. You will find science storage cabinets for your lab microscopes, experiment trays, and classroom skeletons. 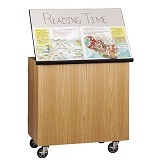 A charging laptop storage cart is also available to match existing science lab furniture. Most science storage cabinets are locking to keep valuable lab equipment and hazardous science chemicals secure while not in use. 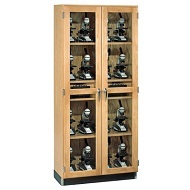 Find quality science storage cabinets from Diversified Woodcrafts.